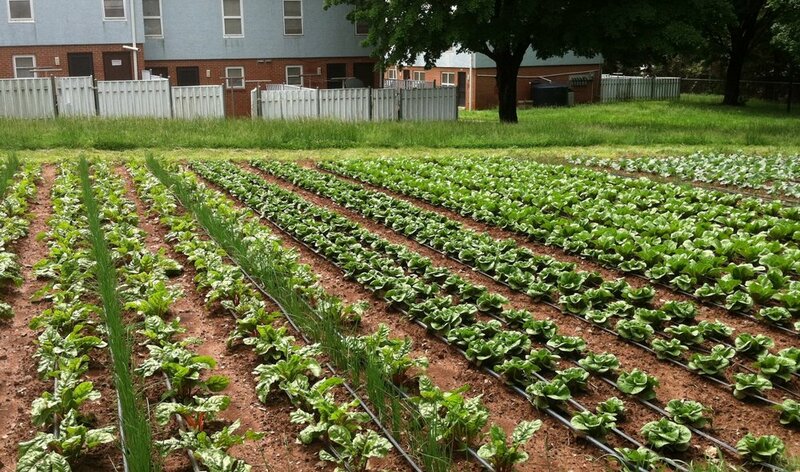 Through a collectively run multi-site urban farm, UACC increases the availability and consumption of fresh, organically grown fruits and vegetables among Charlottesville residents with limited financial resources. In partnership with community volunteers and property owners, UACC currently manages over 32,000 square feet of vegetable gardens and an expanding community orchard and native plant and pollinator sanctuary. We have the capacity to produce over 17,000 pounds of fresh produce annually, all of which we distribute free of charge. Our gardens are located in the Friendship Court, Sixth Street, and South First Street communities in the Ridge Street Neighborhood and on West Street in the 10th and Page Neighborhood. When an individual volunteers in the UACC gardens, she or he earns a wooden farm token for every half hour of service. A volunteer can use a farm token for her or himself or share it with a neighbor. Farm tokens are exchanged for garden produce at weekly, volunteer-operated distribution events called “market days.” During each growing season, UACC offers 20 to 24 market days all hosted by the Crescent Halls, Friendship Court, Midway Manor, Sixth Street, South First Street communities. Depending on the time of year, one farm token is worth a bag of vegetables that would cost $15 to $30 in the grocery store. Market days also serve as a place where people can share information and make connections. Guest chefs offer cooking demos and share recipes made with the weekly harvest. Other community organizations come to market days to share information about upcoming events and new happenings in the neighborhood. UACC believes in the power of urban agriculture to increase interaction and collaboration across racial, economic, and other social barriers. By creating opportunities for engagement in all aspects of our work, we encourage people of all backgrounds to embrace the interconnected nature of living together in an urban environment. UACC is committed to empowering local residents to lead and run the organization. Residents who live in the communities where we garden make up the majority of our leadership team. Their guidance and vision for the organization ensures that our work remains meaningful, relevant, and valuable to the communities where we work. Finding the right people and developing each person’s skills takes time, trust, and support. As we work toward increased resident ownership, we are grateful for the help of other community partners who provide guidance and expertise as we grow and evolve. In recent years, gentrification and the proposed redevelopment of the Ridge Street Neighborhood has created an air of uncertainty about the future, especially for residents who live in the communities of Crescent Halls, Friendship Court, Sixth Street, and South First Street. Members of UACC’s leadership team were instrumental in the formation of the Friendship Court Residents Association (FCRA) in 2015 and many of our participants are active in the Public Housing Association of Residents (PHAR). UACC strongly supports FCRA, PHAR, and other grassroots efforts by residents to advocate for their interests in the dialogue on redevelopment.